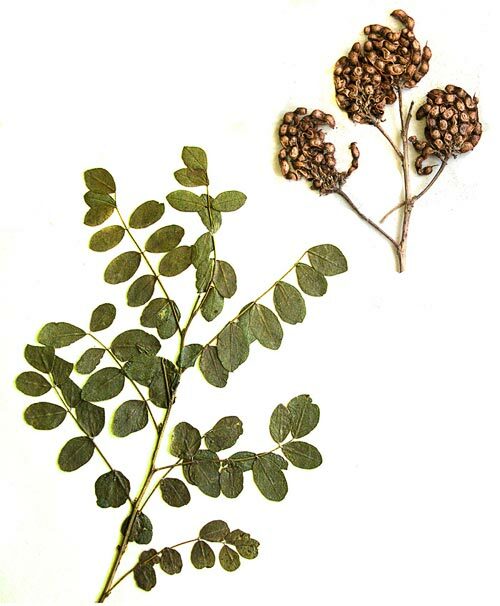 AgroAtlas - Relatives - Glycyrrhiza uralensis Fisher - Chinese Liquorice. Glycyrrhiza uralensis Fisher - Chinese Liquorice. Family Fabaceae Lindl., genus Glycyrrhiza L.
Peerennial herbaceous plant. Stems 40-70 cm tall, erect, simple or branched, shortly pubescent, like the whole plant, covered with small brownish glandules, sometimes with admixture of glandular spinules. Leaflets oblong-elliptic or ovate, 4-6 pairs. Inflorescences dense racemes 3-6 cm long. Flowers numerous, whitish-pink, calyx 9-14 mm long, calyx teeth lanceolate, subequal to tube. Ovary with 8-11 ovules. Pods 2-4 cm long, densely condensed in a dense ball, usually intensely falcately bent and zigzag-flexuous, more or less densely covered with short hairs, sessile glandules and long glandular spinules. Flowers and fruits in June - August. Cross-pollinated entomophilous plant. 2n=16. Urals, Siberia, steppes and semideserts of Central Asia. In steppe zone in subsaline, steppe meadows, at lake and river sides, in ravines, on slopes, in depressions. Tolmachev AI., ed. 1983. Atlas of medicinal plant ranges and resources in the USSR. Moscow: Principal Office of Geodesy and Cartography. 340 p. (In Russian). Shishkin BK., Bobrov EG., eds. 1948. Flora URSS. V.13. 588 p. (In Russian). Polozhij AV., Malyshev LI., eds. 1994. Flora of Siberia. V.9. Fabaceae (Leguminosae). Novosibirsk: Nauka. 280 p. (In Russian). Malyshev LI., Peshkova GA., eds. 1979. Flora of the Central Siberia. V.2. 506 p. (In Russian). Kamelin RV., Kovalevskaya SS., Nabiev MM., eds. 1981. Manual of plants of Middle Asia. V.6. Tashkent. 395 p. (In Russian). Roskov YR. et al. 2005. ILDIS World Database of Legumes. [Online] Available at: http://www.ildis.org/LegumeWeb?sciname=Glycyrrhiza%20uralensis .